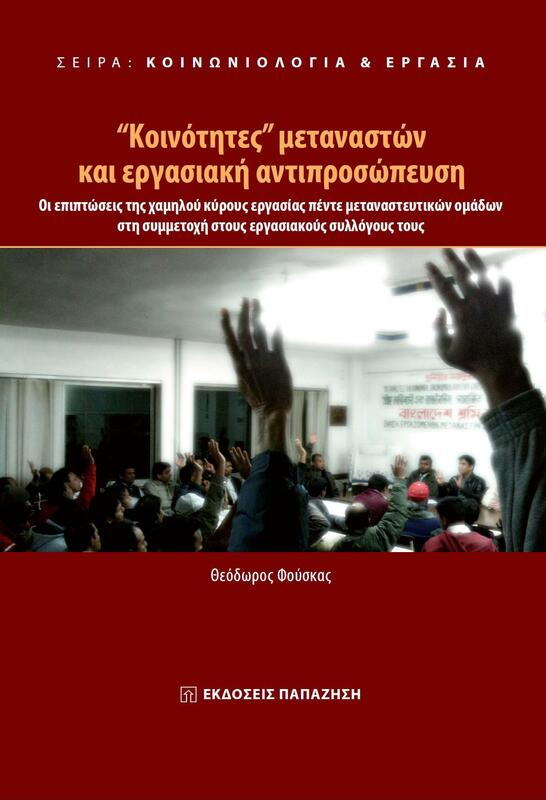 Bio: Dr. Theodoros Fouskas is a sociologist. He specializes in migration, migrant labour and migrant community organizations. Also, in precarious, low-status/low-wage employment, integration of third country nationals, undeclared work, irregular migration, access of migrants to healthcare, solidarity, social protection, political participation and trade unions in the reception societies. He has taught the courses “Migration Policy” at the Department of Social and Educational Policy of the University of Peloponnese (UoP) (2018-2019, NSRF, Teaching Scholarship), “Sociology of Migration” at the Department of Sociology of the University of Crete (UoC) (2017-2018, NSRF, Teaching Scholarship), “Migration – Migration Policy and Integration Policies” at the Department of Social Administration and Political Science of the Democritus University of Thrace (DUTH) (2017-2018). He has also taught the courses “Sociology of Health and Illness” at the Department of Sociology of the National School of Public Health (NSPH/ESDI) (2017-2018, 2018-2019), the laboratory course “Writing of Scientific Study and Bibliographic Research” at the Department of Social Work at the Technological Educational Institute of Athens (2017-2018, 2016-2017, 2014-2015), “Hellenic Diaspora” at the Department of Hellenic Studies at the Hellenic Open University (HOU) (2017-2018, 2018-2019), “Irregular Migration”, at the Department of Professional Training of Staff-Executives (TEMES) at the Police Academy - School of Further Education and Training (2011-2018) and at the Institute of Training of the National Center for Public Administration and Local Government (2012-2019). Moreover, he has taught in private academic institutions the courses: “Skills Course: Advanced qualitative and quantitative analysis” (MA) and “Skills Course: Introduction to qualitative and quantitative analysis” (BA) at the European Law and Governance School (ELGS) of the European Public Law Organization (EPLO) (2017-2018) and “American Immigration” (BA) at the Department of International Relations at the New York College (NYC) in the Department of Postgraduate Studies in collaboration with the State University of New York/Empire State College (2013-2014). Finally, he has lectured as visiting professor in many national academic institutions, in co-operation with the Department of Public and Administrative Health and the Department of Sociology of the National School of Public Health (NSPH/ESDI), the Department of Primary Education at the University of Patras, the Department of Social and Educational Policy at the University of Peloponnese and the Department of Sociology at Panteion University of Social and Political Sciences. 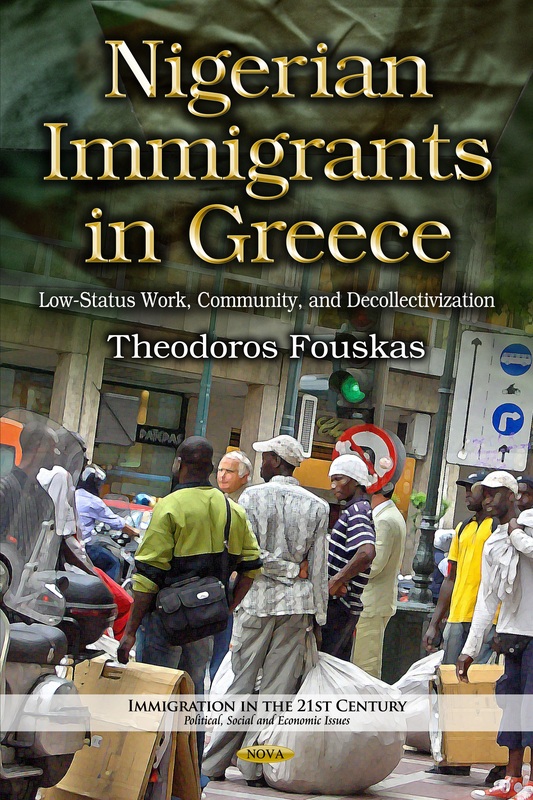 He has authored 2 monographs: Nigerian Immigrants in Greece: Low-Status Work, Community, and Decollectivization (Nova Science Publishers, 2014) and Migrant “Communities” and Labor Representation (Papazisi Publishers, 2012, in Greek) and he has co-edited the collective volume: Contemporary Immigration in Greece: A Sourcebook (EPLO Publications, 2014). Currently, he is preparing the edited collective volume entitled: Immigrants, Asylum Seekers and Refugees in Times of Crisis: International perspectives. Volume 1 and Volume 2. (Preface by Roger Zetter, Marco Martiniello and Spyridon Flogaitis) (European Public Law Organization, forthcoming, 3Q 2019) and the monograph Lives (un)maid in Greece: Migrant Filipina live-in domestic workers (Preface by Professor Bridget Anderson and Professor Giovanna Campani) (Nova Science Publishers, forthcoming, 3Q 2019). He has authored 11 chapters in edited collective volumes and published 16 articles in international and Greek peer-reviewed scholarly journals. Recent articles of his are: “Precarious employment repercussions on migrants’ perceptions regarding healthcare”, International Journal of Human Rights in Healthcare, 11(3), 2018 and “EU societies divided in unity? The changing influx of asylum seekers in 2014-2016 in Greece and the EU Member States’ societies disunity due to the impact of the migration and refugee crisis”, European Politeia, 5(1-2), 2017. Moreover, he has authored and co-authored 30 research and policy reports. He has served as a reviewer for 12 journals and member of the editorial board in 2 of them. He has presented 75 papers at international and national conferences and workshops, and he has organized 12 scientific events and 3 international summer schools on migration: Migration Summer School (MIGSS): “Migration in Southern Europe: Solidarity, Crisis and Beyond” (EPLO, 2017), Migration Summer School (MIGSS): “Precarious Labour, Human Trafficking, & Social Exclusion in Europe” (EPLO, 2018), Migration Summer School (MIGSS): “Moving Beyond Crisis? From exclusion to integration of migrants and refugees in Europe” (EPLO, 2019). Since 2005, he has participated as scientific coordinator, project manager and principal researcher in 32 European and national research programs for immigrants, asylum seekers, refugees and other vulnerable groups. His recent research projects include: the study of the Operation of the Migrant Integration Councils (MIC) in Greece and the participation and representation of migrants at local level via consultative bodies (EIF/EU, Scientific Society for Social Cohesion and Development, 2011-2013), the Detection, transcription, and analysis of inequalities to healthcare access for immigrants living in Greece (THALIS/NSRF, University of Athens, 2012-2014), the investigation of the impact of precarious, low-status/low-paid work on the collective organization of Nigerian immigrants in Greece (2010-2014), the study of the repercussions of the economic crisis on migrants (Panteion University/KEKMOKOP, 2011-2014), Dissemination of Information on Voluntary Return: How to Reach Irregular Migrants not in Contact with the Authorities (European Migration Network, Center for Security Studies, 2015), Integration of Beneficiaries of International/Humanitarian Protection into the Labour Market: Policies and Good Practices (European Migration Network, Center for Security Studies, 2015), Annual Policy Report 2015 on Migration and Asylum in Greece: National Report: Part 1 (European Migration Network, Center for Security Studies, 2016), Annual Policy Report 2015 on Migration and Asylum in Greece: National Report: Part 2 (European Migration Network, Center for Security Studies, 2016), ARIADNE – Developing and Supporting Multisectoral Police Reporting Procedures to Prevent and Respond to Domestic Violence against Women (JUST/2015/RDAP/AF/MULT/9858, Center for Security Studies, 2017), PROACTIVE – Prevent Roma Discrimination Providing Mediation Skills to Police Officers (JUST/2015/RDIS/AG/DISC/9451, Center for Security Studies, 2017), Challenges and practices for establishing applicants’ identity in the migration process (European Migration Network Focused Study, EPLO, 2017), The effectiveness of return in EU Member States: Challenges and good practices linked to EU rules and standards (European Migration Network Focused Study, EPLO, 2017), The Changing Influx of Asylum Seekers in 2014-2016: Member State Responses (European Migration Network Focused Study, EPLO, 2017), Annual Policy Report 2017 on Migration and Asylum in Greece: National Report: Part 1 (European Migration Network, EPLO, 2018), Annual Policy Report 2017 on Migration and Asylum in Greece: National Report: Part 2 (European Migration Network, EPLO, 2018), Local Alliance for Integration (LION) (LION/776213, AMIF-2016-AG-INTE, 2017-2019), PUMOMIG Public opinion, mobilisations and policies concerning asylum seekers and refugees in anti-immigrants times (Europe and Belgium) (BR/175/A5/PUMOMIG, BRAIN-be Belgian Research Action through Interdisciplinary Networks funded by the Belgian Science Ministry, 2018-2019), Labour market integration of third-country nationals in EU member states (European Migration Network, EPLO, 2018), (Member) States’ Approaches to Unaccompanied Minors Following Status Determination (European Migration Network, EPLO, 2018), Impact of visa liberalization on countries of destination (European Migration Network, EPLO, 2018), Attracting and retaining international students European Migration Network, EPLO, 2018), Annual Policy Report 2018 on Migration and Asylum in Greece: National Report: Part 1 (European Migration Network, EPLO, 2019), Annual Policy Report 2018 on Migration and Asylum in Greece: National Report: Part 2 (European Migration Network, EPLO, 2019).